Will Goldston was born on the 23rd September 1878 in Liverpool, England, as Wolf Goldstone. It is believed he became interested in magic at around the age of eleven or twelve. He made his professional debut at the age of 16 using the stage name of "Carl Devo", under which name he frequently topped the bill at provincial theatres with his Black Art act. However, in 1905 he seems to have given up the stage for employment with the London department store A.W. Gamage. He remained as the manager/buyer of Gamage's Theatrical and Entertainment Department until 1914. He edited a number of publications: Magician Annual (1907-1912), Magician Monthly (1904-1913), Magazine of Magic (1914-1930) and Goldston's Magical Quarterly (1934-1940). This book, Exclusive Magical Secrets, was published in a limited edition of 1000 in 1912 and had a lock incorporated into the binding which gave rise to an alternative name of The Locked Book of Magical Secrets. Goldston was an early member of the Magic Circle but resigned and formed his own society - The Magicians' Club of London - with Harry Houdini as President, a post he held until his death. He set up in business as William Goldston Ltd in Aladdin House near Leicester Square in London where he sold "magic tricks". The business was later bought by Davenports, the famous London magic shop. He had two brothers who were also magicians. Reuben, who remained in the Liverpool area, and James Mayer, stage name "Mokana", who died in Calcutta, India at the age of 23 after contracting malaria whilst on tour with the Coronation Circus. He was prolific in his writings, although it is possible that some were ghost written by Arthur Ainslie. He upset many of his contemporaries by revealing their methods either without acknowledging them or, indeed, without their permission. It is somewhat strange that, in this volume, he says that Houdini was born in America when, as a close friend, he should have known that he was born in Hungary. But it is also true that the birthplace of Goldston has been claimed to be Warsaw. Unfortunately, records show clearly that he was born in Liverpool. 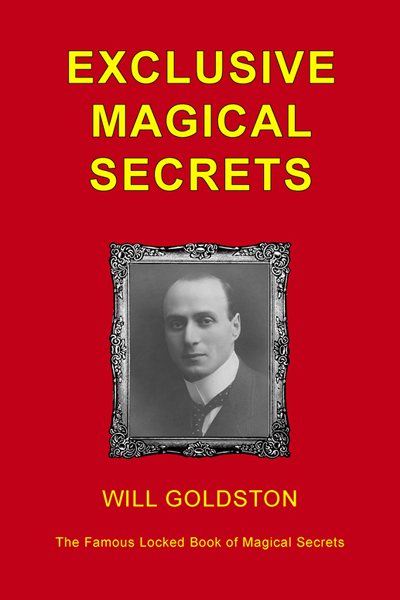 Will Goldston, unlike Houdini, converted to spiritualism and believed in psychic phenomenon, although he also believed that many mediums were frauds who used tricks to deceive people. He published a book on the subject entitled Tricks of the Masters. In 1929 Goldston described, in some detail, the 'Zancigs Code', the methodology by which the Zancigs presented a mind-reading act. Both Arthur Conan Doyle and W.T.Stead, the newspaper man who died on the Titanic, were spiritualists who thought the Zancigs had genuine psychic powers. Revelation of the code proved them to have been deceived. If he had been alive today it is likely that Will Goldston would have been one of the most famous people in the world of magic. As it is his legacy stands, not only in his writings but also in the inspiration he gave to future generations of magicians.